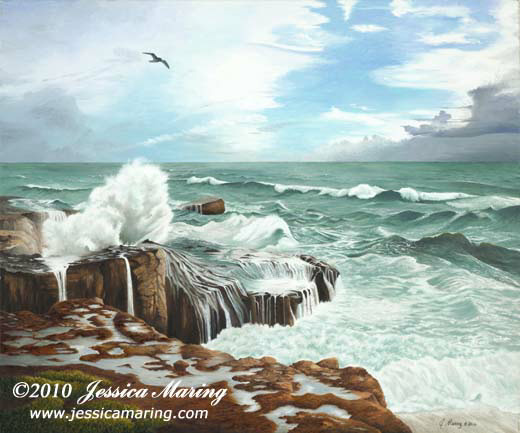 The photographs which were the basis of this seascape were taken in January, 2010 behind the Santa Cruz Lighthouse. The day was gray and leaden from horizon to horizon when suddenly, the clouds parted, and light hit the rocks. Winter brings magnificent, incomparable storms to the Santa Cruz coast. Below the Lighthouse, rocks and currents shape and twist the waves in every direction. Sea foam blows on the wind, and one can feel the thunder of waves breaking against stone. The sea lions, which populate the far rock in summer, have fled, and only seagulls remain. The wind is harsh. One can almost lean on it.